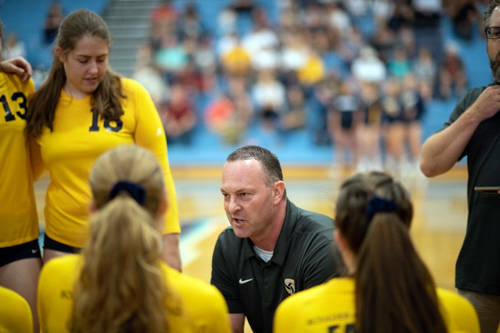 (Robert Vendettoli/Boulder City Review) Kurt Bailey, who led Boulder City High School's volleyball team to its second consecutive state championship in his first year as head coach, was named the 3A coach of the year. Capping off a back-to-back 3A state championship season, Bailey inherited the program from coaching legend Cherise Hinman, who stepped down last spring after 20 seasons at the helm. Leading perhaps the greatest single season in school history, Bailey coached the Lady Eagles to a program-high 38 victories, helping Boulder City go undefeated in league play for the first time since 2012. Of those players who stepped up, four Lady Eagles were named 3A all-state selections, highlighted by 3A player of the year, Kamry Bailey. Breaking out in her sophomore season, Kamry Bailey also made the Nevada all-state team, which highlights the best players regardless of classification. She generated 350 kills, 198 digs, 101 serving aces and 27 blocked shots. Also making the 3A all-state first-team were sophomores Ava Wright and Sierra Orton, who, alongside Kamry Bailey formed a dynamic underclassman trio. Wright dished out a school-record 1,084 assists, the second most all-time for a single season in the 3A classification behind Faith Lutheran setter Megan Kronschnabel, who set the record in 2015 with 1,135 assists. An all-around threat for the Lady Eagles, Wright was also named to the Nevada all-state second-team after generating 203 digs defensively, 139 aces and 27 blocks. A two-way contributor for the Lady Eagles, Orton tallied 214 kills offensively and 66 blocks on the defensive end, while second team 3A all-state selection Raegan Here generated 179 kills and 43 blocks. With all four players returning, coach Bailey said he is hopeful to keep the team’s winning tradition and state championship run intact.